Smartex is a great solution for building a WordPress powered business or corporate site. It features a full-screen slider in the header section. Here you can place branded photos or the logo of your company to give the site a touch of personality. A clean layout coupled with a variety of transparent elements, ghost buttons, and other elements adds some fresh style to this business company WP theme. Thanks to a number of customization tools and plugins, it can be completely redesigned or adapted to any other business project lightning fast. Retina Ready layouts are the perfect solution to display your high-resolution designs on screens with any specific pixel-density. Retina Ready layouts make all visuals and website content appear sharper, brighter, and more vivid. This valuable feature will allow you to embed video background to your website. Background video can help to develop a lovely and more professional looking online site. An online portfolio is a web page that helps to arrange and showcase digital files such as images, essays, website demos, etc. in a beneficial manner. By means of a portfolio, you could make your works jump out. Whilst integrating the portfolio in your web-site, you expand the probabilities that the audience might be engaged with your article content and also keep coming back for more complete study. MotoPress Editor is definitely a successful editor application for WordPress. There's no need to be a pro developer or computer programming professional in an effort to establish a unique as well as practical site. With the MotoPress Editor, you are able to experience the simplicity of building up an adaptable and also ultra powerful internet project thanks to an intuitive webpage builder. MotoPress Slider is an excellent resolution for people who would like to set-up beautiful slides with magnificent visual effects. MotoPress Slider enables you to create beautiful slideshows, seamless shifts, effects, and animations, implement textual content, photos, or video clips into slides and animate each layer separately. Responsive design renders a web page exact same properly on any existing screen size. Responsive web page design allows you to enrich consumer experience and provide a full access to the website details from any device. A parallax scrolling effect is a technique in website design when background image moves at a slower pace compared to a foreground article, creating the illusion of multi-level effect. Parallax scroll looks stunning and appeals to users' sight to the images and content modules. Search Engine Optimized design templates were created to draw in customers and search engine bots to your web property. Since people have faith in search engines, therefore websites that appear to be in the top of search result will increase the number of clients and lead to great income. Can I resell WP templates for Business & Services I bought the developers license for? What is the price for acquiring the extended license for WP template for Businessman ? There is no set price for acquiring the extended license. The price is based on the WP template for Businessman 's unique price for those templates you would like to use for the integration. The price for purchasing license for a single template is half of the template unique price. What is GNU GPL v3.0 license and can I use it with Corporate WP template? If you buy a Corporate WP template released under GNU General Public License v3.0, you can use it on any number of projects belonging to either you or your clients without any limitations. This license allows you to modify the template and its sources to suit your needs. Are images included in the WP templates for Business Bureau released under GPLv3.0 license? In the WP templates for Business Bureau released under GNU GPL v3.0 images are not included and are used for demo purposes only. Is it possible to reactivate my download link for WordPress design theme for Business News if it was deactivated after 3 days? Yes. Please re-activate the download link for WordPress design theme for Business News within your account under the Downloads tab or contact our billing department directly regarding that. Are there any restrictions for using imagery, cliparts and fonts from the Business Bureau WordPress template I purchased? All imagery, clipart and fonts used in Business Bureau WordPress template are royalty-free, if not stated otherwise on the product page, and are the integral part of our products. One Time Usage License and Developers License give you the right to use images, clipart and fonts only as a part of the website you build using your template. You can use imagery, clipart and fonts to develop one project only. Any kind of separate usage or distribution is strictly prohibited. Make sure that these charges for Business Bureau WordPress template have different order IDs. If it is so, contact our billing department. Do you provide any scripts with your WP templates for Business Magazine or could you do some custom programming? Can I put low resolution thumbnails of WordPress design themes for Services on my website for my clients to choose designs? How many applications, programs etc can I use to integrate with the Business Bureau WP templates under one extended license? The extended license gives you the right to use the purchased Business Bureau WP templates for the integration with one software/freeware/application/CMS/sitebuilder only. In case you would like to use the template with the other application, the other license is to be acquired. Can I put a line at the bottom ( or any other spot) of the customized WP theme for Business Company "Website design by Company name"? No, you cannot place a line at the bottom ( or any other spot) of the customized WP theme for Business Company saying "Website design by Company name". Nevertheless, you can place "Customized by Company name". 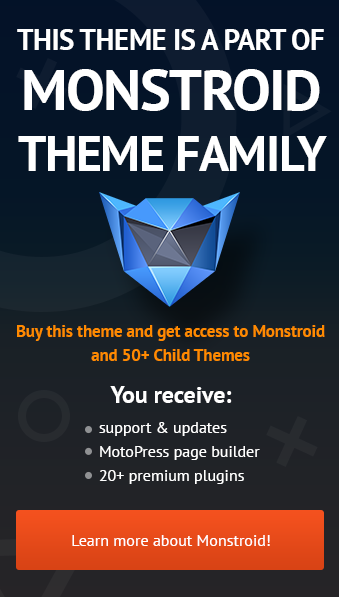 In what cases I don't need the extended license for WP themes for Business? What do I receive when I order a WordPress theme for Business & Services from TemplateMonster.com? After you complete the payment via our secure form you will receive the instructions for downloading the WordPress theme for Business & Services. The source files in the download package can vary based on the type of the product you have purchased.If you need unzipping software to open the .zip archive, Windows users may visit www.WinZip.com, Mac users may visit www.StuffIt.com. Yes. It is perfect for designers who want to offer their customers a high-quality design and also save time and money. Keep in mind that when you purchase the WordPress design theme for Business Firm with ordinary or exclusive license you're entitled to create only one project (one domain name). Can I get the WordPress design theme for Business Firm in higher resolution to use for printing? Is it possible to buy the particular image from the WP template for Businessman ? No. According to our Terms and Conditions we never sell the images separately from WP templates for Business & Services (as well as the templates separately from the images). I like the image from the WP template for Services and would like to use it for my advertising campaign, can you send me this image in a higher resolution? No, we can't provide image in higher size or resolution rather than it is on the WP template for Services. We recommend looking for professional images on online photo resources. I have customized the WordPress theme for Business Magazine and would like to protect my content by copyright, can I place Copyright, Mycompanyname.com? After WordPress theme for Business Magazine purchase you can put your copyright to the template. But you cannot place a line at the bottom (or any other spot) of the customized project saying "Website design by Company name". Nevertheless, you can place "Customized by Company name". Will TemplateMonster help me to edit my WordPress template for Business Bureau ? TemplateMonster offers you a variety of sources to help you with your WordPress template for Business Bureau . Use our comprehensive Online Help Center to get the basic knowledge about your WordPress template for Business Bureau . Our Knowledgebase contains customers questions and most frequent problems. Anyway, you can always use TemplateMonster 24/7 phone support, try our Ticket System or Live Support Chat to get qualified assistance from our support representatives. No, you cannot resell the customized WP theme for Business Company as a template but you may sell it as a project to your client (see paragraph 1 ONE TIME USAGE LICENSE for more details). Can I resell the WordPress design theme for Business News as is? No, you cannot resell the WordPress design theme for Business News as is. Is it possible that Template Monster will contact my client which website I made from Template Monster's website Corporate WP template? Yes, our legal department checks licenses regularly. In case we won't find designer's contact information on the site which was made from the Corporate WP template of ours we will contact the owner of the site directly. I ordered a WP theme for Business Company but haven't received the download information. What are the advantages of purchasing a WordPress design theme for Business News ? The major advantage of purchasing a WordPress design theme for Business News is price: You get a high quality design for just $20-$70. You don't have to hire a web designer or web design studio. Second advantage is time frame: It usually takes 5-15 days for a good designer to produce a web page of such quality. Can I resell the customized WordPress template for Business? Yes, you can redistribute WordPress template for Business under the terms of the GPL as well. Can I resell the Business Firm WordPress templates I bought the extended license for? No, you cannot resell the Business Firm WordPress templates as is. You can only sell them as the integral part of your new product. Can I put a line at the bottom (or any other spot) of my new product "Website development by Company name" after purchasing Business Company WordPress theme? Yes, you can place a note at the bottom (or any other spot) of my product "Website development by Company name". Nevertheless, you cannot place "Website design by Company name"while using one of Business Company WordPress theme. Are there any discounts if I'm buying over 10, 20, 30 or more Business Bureau WordPress template? Please email to marketing@templatemonster.com with your inquiries about Business Company WordPress templates. Can I customize the WP template for Businessman if that's required by application settings? Yes, you can customize the WP template for Businessman code, graphics, fonts to any extent needed. Can I customize the WP template for Services? Yes, you can customize the WP template for Services to any extent needed. You cannot use a header of the template for one project though, and images from the template for the other project. Requests for a refund are accepted at www.template-help.com/tickets within the period of 2 weeks after the order of Business Bureau WordPress template is placed. You should accompany this request with detailed and grounded reasons why you apply for a refund. Please make sure your request does not contradict the terms and conditions specified in the policy. A refund is issued to you upon receipt of a Waiver of Copyright signed by you. What is a unique purchase license for WP template for Services? If you purchase the product at a â€˜Unique price' it guarantees that you are the first and the last person to buy this WP template for Services from us. It means that this template has not been sold before and you become an owner of a unique design. After this kind of purchase the template is being permanently removed from our sales directory and is never available to other customers again. The unique purchase license allows you to develop the unlimited number of projects based on this template, but the template should be customized differently for every project. Are there any limitations on selling the Business Company WordPress theme as the integral part of my new product? What will I see instead of the images after installation of the WordPress template for Business Bureau ? After WordPress template for Business Bureau installation you will see blurred images included for demo purposes only. How can I modify WP template for Services to suit my particular website? Please visit our Online Help Center to obtain detailed instructions on editing WP template for Services. In my opinion very tasteful but above all a functional template. I chose it for my company, providing cleaning and disinfection services (www.ozonuj.pl) and the final effect passed my expectations. It&#039;s a professional website in every way. Template support for an inexperienced Wordpress operator has some problems, but at any time of day or night you can get professional help for free. And many times I did it. I sincerely recommend. If you&#039;re looking for template that offers a minimalist look, while still giving a good professional first impression, this would be a good theme to go with. My only suggestion would be to eliminate the video presentation area on the homepage of the site. It&#039;s a nice effect, and you can replace it with other stock video footage. But the catch is that the file sizes of stock videos tend to be high. So the load times for the site may be high. Also, you can switch out the icons used on the homepage (paperclip, calendar, pen) for other icons, but you&#039;ll have to go through tech support to find out how to swap them out. Overall a nice, simple little theme that works well for a small business. Great template. Worked well with the project I was working on. It was easy to update and edit. Just had a few bumps trying to install it, but once I called support everything worked well. Using the cherry plug in, helped designing and updating the template easy. This made the projects very easy to complete. I would recommend this template for any web design projects that need to be done quickly. The extra plugins that came with the template made it even better. Easy to implement as well as modify. There were a lot of plugins available and made the deployment of our site easy. Interesting theme with good looking styles. I had to fix little bit to for my tablet resolution, but otherwise works fine! Brilliant theme. Could have wished for more pictures to choose from and the ability to change colors without too much hassle. Overall I simply love it and my new website based on it. Looking forward to doing more with more of these fantastic templates. Nice work! Very easy to work with. Good support and never had a problem with other themes. Can the colour of the golden/yellow areas of the template be changed? Can the images in the circles, such as a paper clip. be chnaged to something else? Does the video presentation file with the golden droplets video file and pictures come with the template for our use? How much is it customizable with the standard license? Can i change colours as i want or i need to buy some other permission?